Previous years’ Love To Roll! 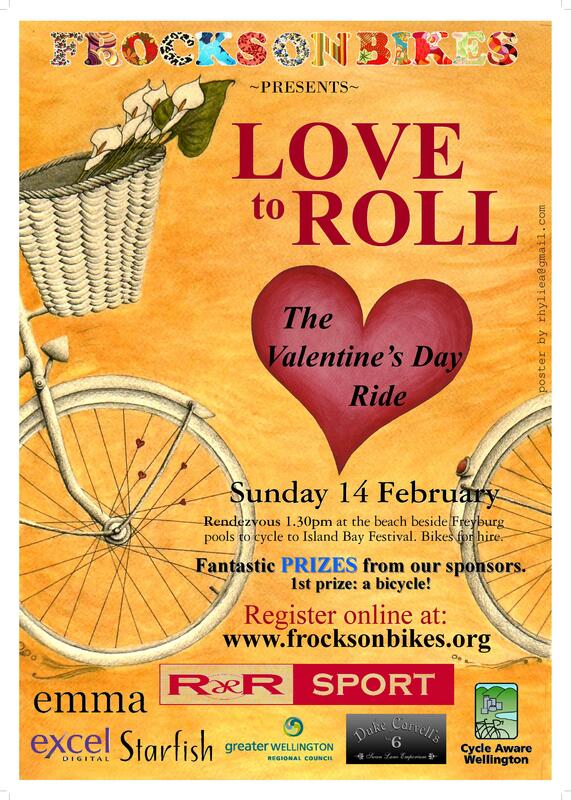 Each year Frocks On Bikes celebrates summer, cycling and love with our Valentine’s Ride. Love To Roll 2011 was even bigger and better than 2010’s! 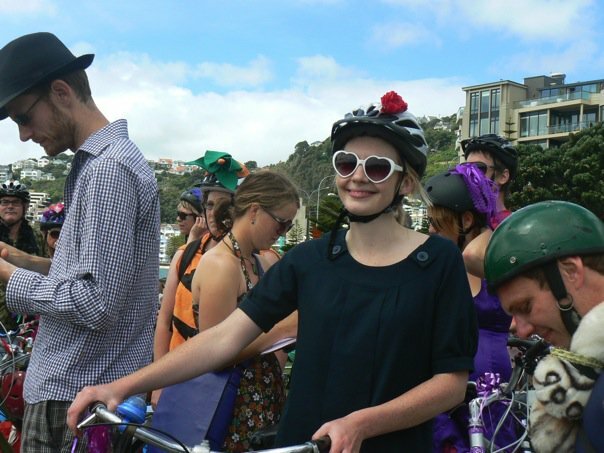 Over 170 Wellingtonians dressed up for a date and accessorised with two wheels for the Valentine’s ride. 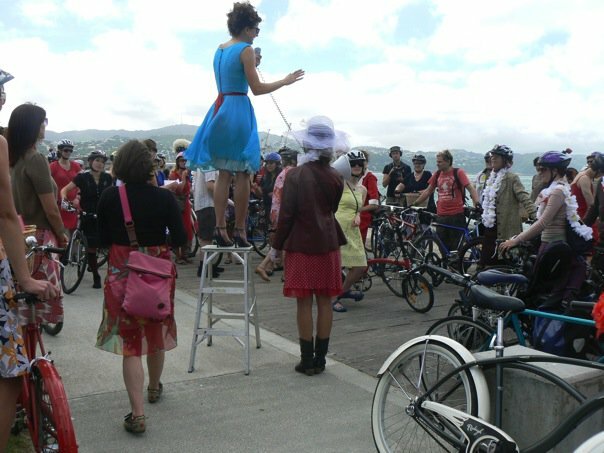 From rendez-vous at Oriental Bay, the Love to Roll cavalcade gathered sunglasses, wheels and (prospective) better halves and headed South – en route for the Island Bay Festival. We cruised along at a leisurely pace, with the passing traffic waving, smiling and tooting to us. Our marshalls, their bikes marked with yellow hearts, helped keep Love To Roll safe and road-legal. In case you missed it – video! Halfway we stopped to judge the hotly-contested competitions, with prizes from Duke Carvell’s, Emma Collections, Paramount Cinema, and A La Mode photography up for grabs. Yes, it’s superb video by Little Fighters! 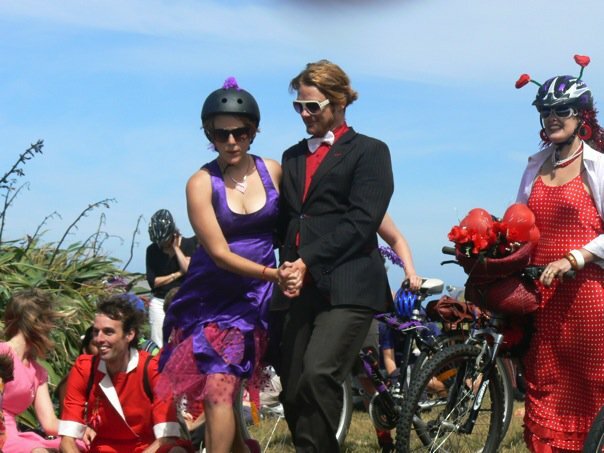 Contestants vied for Most Awesome Bike, Most Chic Lover To Roll, and Best-Dressed Couple (any combination). 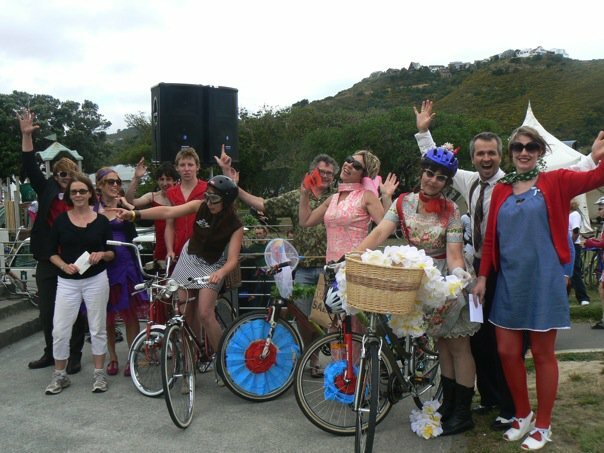 Despite best guesses about category winners, a random draw for a Mamachari urban bike kept everyone guessing through the final part of the ride to Island Bay’s Festival. Lovers To Roll look great in motion! The gorgeous South coastal road took us smoothly around towards Island Bay, enjoying the seagulls and chatting to fellow Lovers To Roll. The Island Bay Festival was a blast, with excellent food, music and scorching sun. 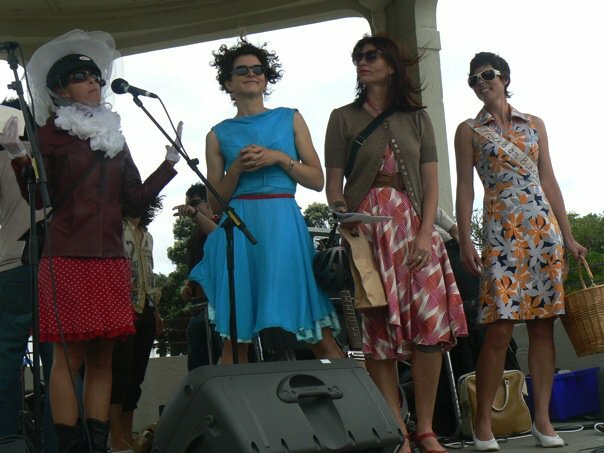 Frocks On Bikes’ mothership crew took to the stage and had the crowd cheering Love To Roll’s prize-winners, applauding the eventual winner of the Mamachari urban bike and leaping for spot prizes from On Yer Bike. See our Facebook page for gorgeous photos by Jess and click here for some cool colourful photos from Paul. 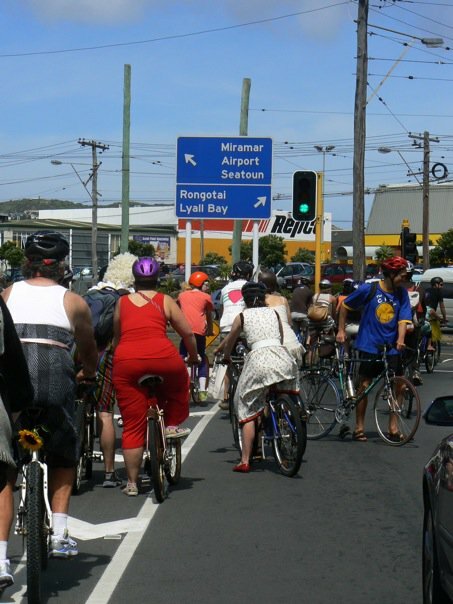 Another Love To Roll… another fantastic celebration of summer, love, and Wellingtonians looking great on two wheels! 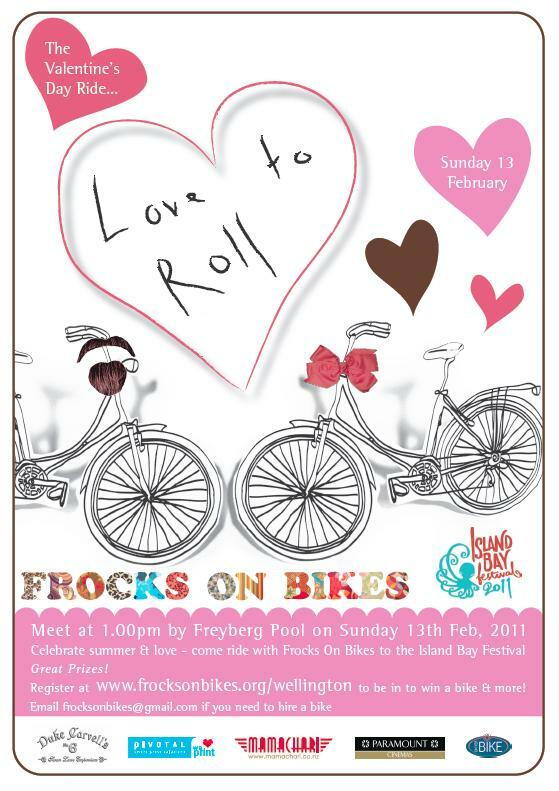 and to all our supporters and sponsors for Love To Roll 2011! 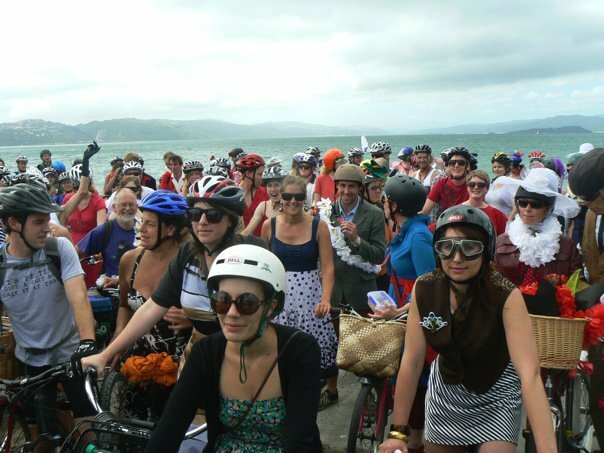 A stunning grand total of 151 – yes, that’s ONE HUNDRED AND FIFTY-ONE Wellingtonians came out on their wheels in their flashest threads to join the inaugural Love To Roll! …and getting our photos taken. 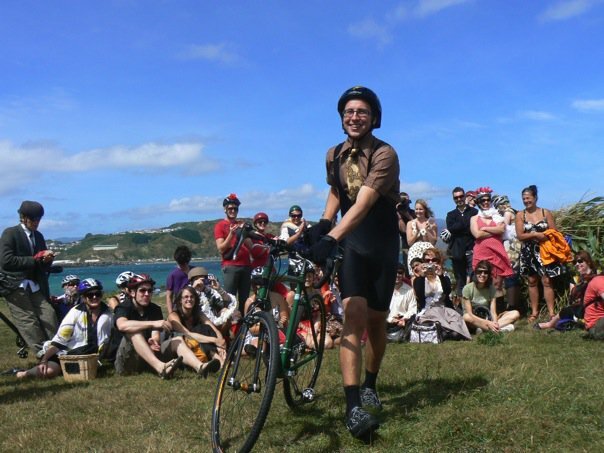 Wellington Lovers To Roll: styley peeps! And then… we hit the road! Round Oriental, Little Karaka, Balaena and Weka Bays, through Evan’s Bay we rolled, with the traffic tooting and waving to us! 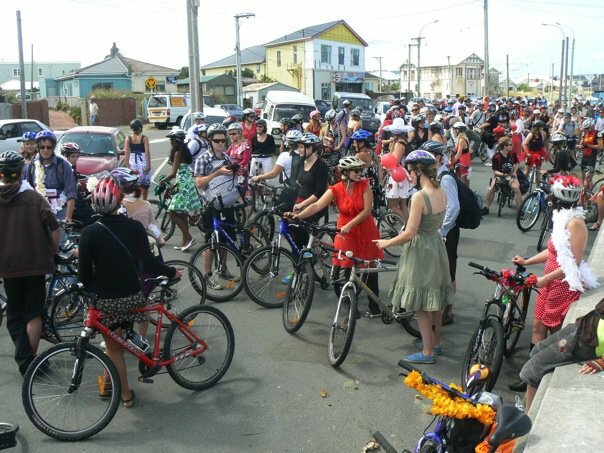 …we headed out through the city to Lyall Bay in style. Please note: what looks like a merry mess in this photo was in fact one of our many intersection navigations – all of them safe, smooth and smiley for traffic and Lovers To Roll alike. Props to the be-lei’d Marshals! We were aided by funky on-the-road sounds, courtesy of the tailor-made mobile high-fi – thanks to Paul and Nick, trailer-makers (and trailer-tower) extraordinaire. Now it’s an impressive thing to see 150-odd stylish cyclists of any stripe, but a massed peloton of Lovers To Roll is a special spectacle. Look at us all! And therere loads more out of shot! 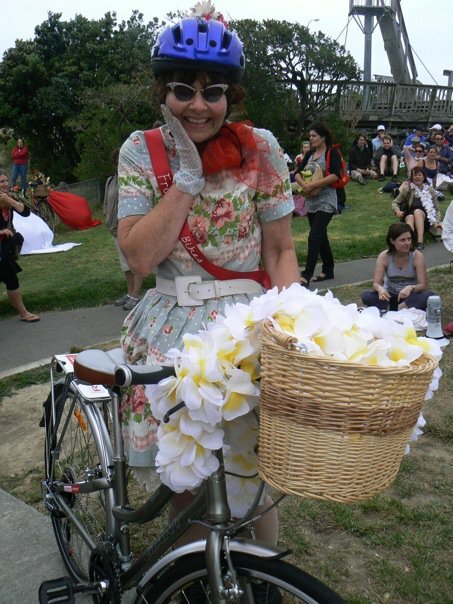 …to tell the crowd what Frocks On Bikes and Love To Roll are all about. We also had the delightful task of announcing runners-up and winners of the categories, a spot prize for effort, and drawing the Grand Prize – the R&R Supreme Frocker! The fabulicious Claire and the Supreme Frocker Prize! …and the winner of Supreme Frocker was delighted with her prize! 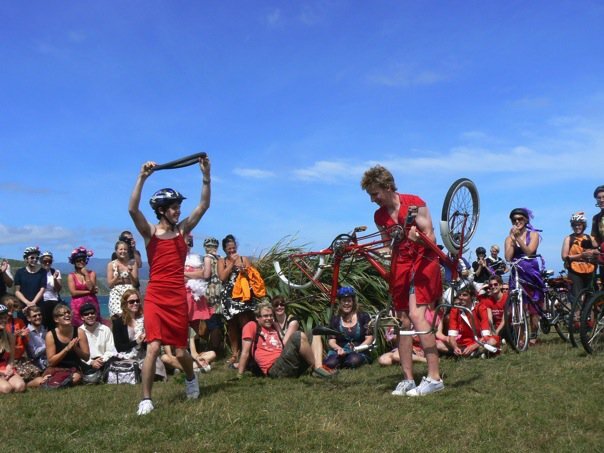 From then the Lovers To Roll ate, drank, socialised, and danced the day away, entertained by the Island Bay Festival’s many delights. 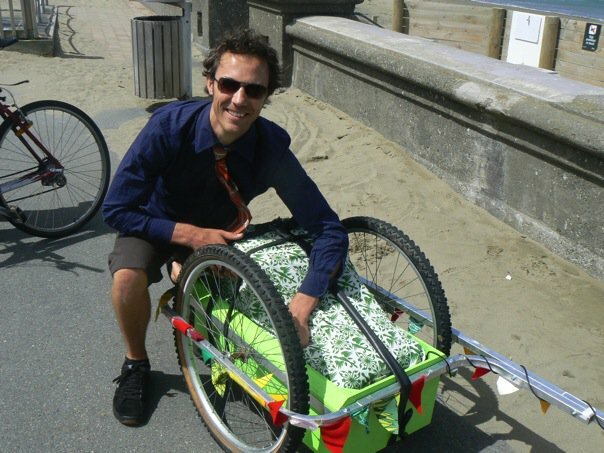 Wellington: We Love To Roll! 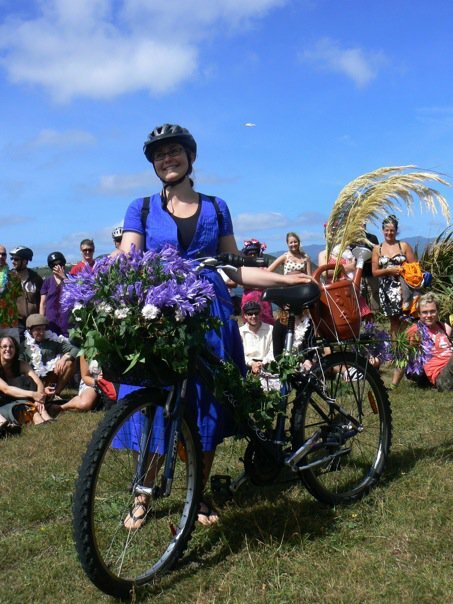 ♥ the fantastic Green Bike Trust– for providing steeds for a dozen bikeless Lovers To Roll ♥ the lovely Claire Pascoe – see above! 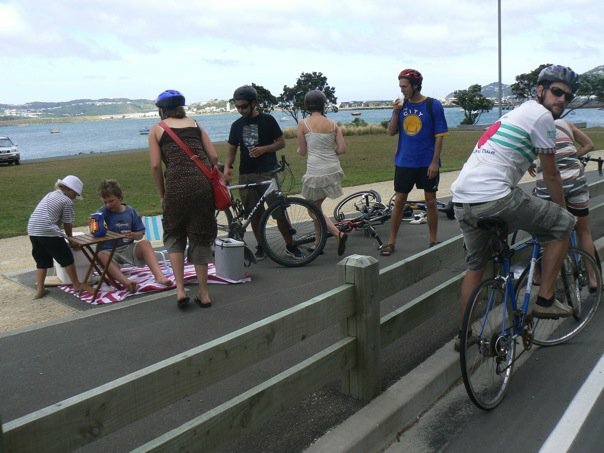 – for her tireless work, and♥ our own Greater Wellington, the Regional Council, for their generosity. Love To Roll wouldn’t have happened without you! 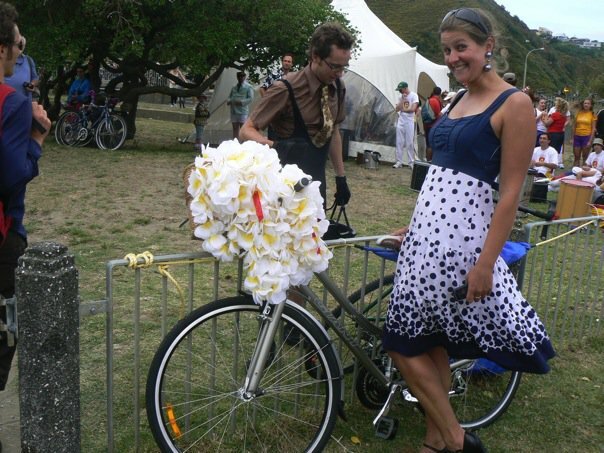 Frocks On Bikes *HEART* you all! 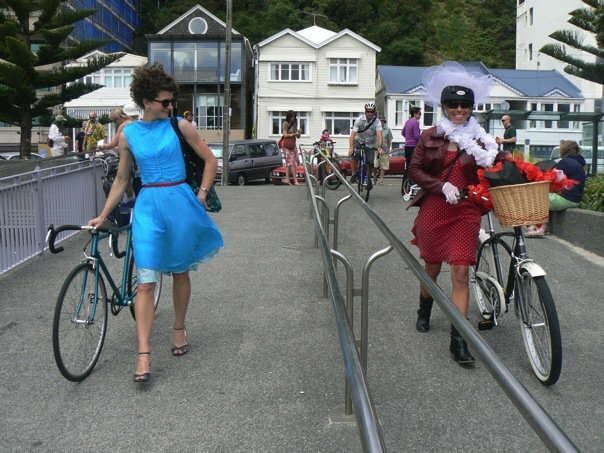 and ….Frocks On Bikes *heart* the fabulous Liz Price for her generous publicity work! Thanks to Rhylie Alexander for these great photos!